The Eumig C1 was introduced on the market in 1932. It is equipped with a lens Meyer Trioplan 1:2.8 20mm. 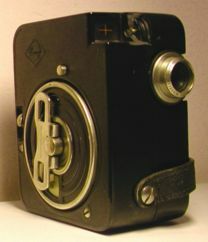 The movie camera has a black Bakelite housing; its weight is kg. 1,450 and its size is 63x127x115 mm. 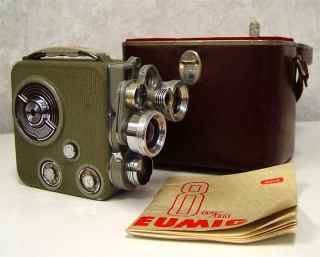 It is the first movie camera produced by Eumig. It used the 9,5mm format. The Eumig C3 was introduced on the market in 1954. It is equipped with a lens Eumigon 1:1.9 12,5mm. 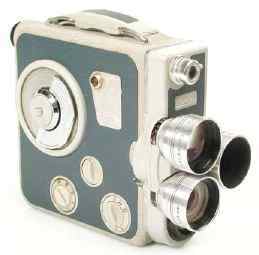 The movie camera has a grey metal housing; its weight is kg. 1,150 and its size is 45x117x132 mm. Under the lens there is a lever for opening and closing the diaphragm from 1.9 to 16. 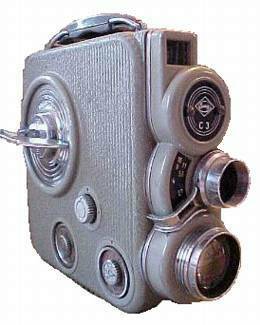 The movie camera has a grey metal housing, with inserts of blue skin. It weights kg. 1,250 its measure are the following: 44x121x170 mm. My movie camera is perfect. 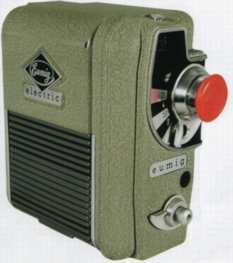 The movie camera has a grey metal housing, with inserts of blue skin. It weights kg. 1,200 its measure are the following: 45x116x155 mm. The Electric was introduced on the market in 1955. It is equipped with a lens Anastigmat Eugon 1:2.7 da 12,5mm. The movie camera has a grey metal housing; its weight is kg. 0,750 and its size is 55x117x113 mm.